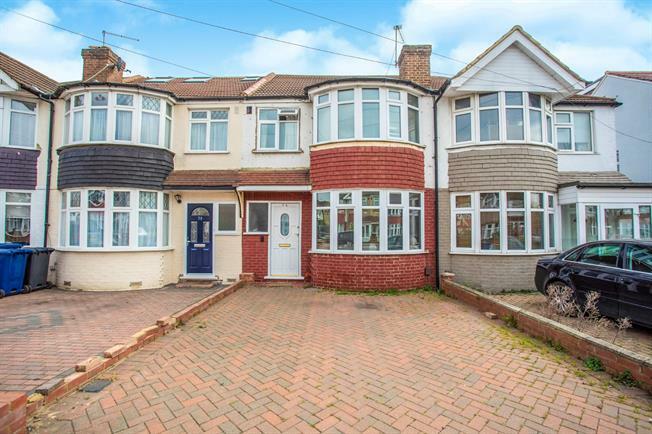 3 Bedroom Terraced House For Sale in Greenford for Asking Price £450,000. This three bedroom terraced house comprises briefly of two reception rooms, kitchen, three bedrooms and bathroom. The property benefits from double glazing, gas central heating, front and rear gardens. Wooden front single glazed door. Double glazed uPVC bay window facing the front. Radiator, laminate flooring, under stair storage, picture rail, painted plaster ceiling, ceiling light. Double glazed uPVC bay window facing the front. Radiator, laminate flooring, picture rail, painted plaster ceiling, ceiling light. UPVC patio double glazed door, opening onto decking. Double glazed uPVC window facing the rear. Radiator, laminate flooring, picture rail, painted plaster ceiling, ceiling light. UPVC back double glazed door, opening onto decking. Double glazed uPVC window facing the rear. Laminate flooring, part tiled walls, painted plaster ceiling, ceiling light. Wood and roll top work surfaces, fitted and wall and base units, single sink and with mixer tap with drainer, space for, gas oven, space for, gas hob, over hob extractor, space for washer dryer, fridge/freezer. Laminate flooring, picture rail, painted plaster ceiling, ceiling light. Double bedroom; double glazed uPVC bay window facing the front. Radiator, laminate flooring, picture rail, painted plaster ceiling, ceiling light. Double glazed uPVC window facing the rear. Radiator, laminate flooring, picture rail, painted plaster ceiling, ceiling light. Double glazed uPVC window facing the front. Radiator, laminate flooring, picture rail, painted plaster ceiling, ceiling light. Double glazed uPVC window facing the rear. Radiator, laminate flooring, part tiled walls, painted plaster ceiling, ceiling light. Low level WC, roll top bath, single enclosure shower, pedestal sink.